MoviePass owner Helios & Matheson hit an all-time low of $US0.37 a share on Tuesday. The company is fighting for its survival as it continues to burn through cash. Watch Helios & Matheson trade in real time here. MoviePass owner Helios & Matheson just hit another record low as it continues to burn through cash. Shares are down more than 10% and trading at an all-time low of $US0.37 a share. In mid-April, an internal auditor said there was “substantial doubt” the company would be able to stay in business. A few weeks later, the company said it burns about $US21.7 million a month, and that its shrinking cash pile is down to $US15.5 million. MoviePass CEO Mitch Lowe has suggested the company will climb its way out of the hole by using its $US300 million “equity line of credit,” but financial experts told Business Insider that cash won’t necessarily be there when needed. The stock got a temporary boost of more than 6% last week when Citadel Securities announced it had amassed a 5.4% stake in the company. It hit $US0.44 a share that day, but has since slid 15% from that level. 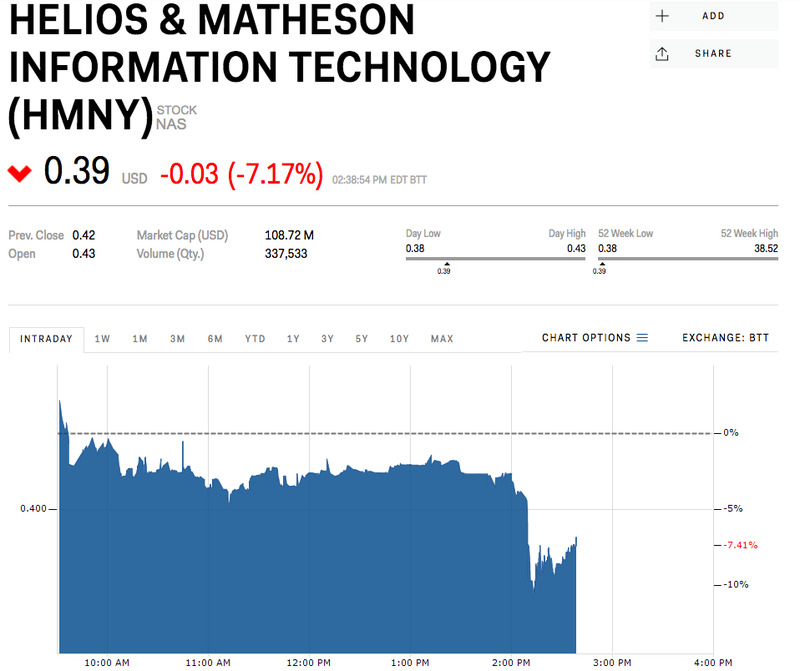 Helios & Matheson is down 94.52% this year.